Turkey burgers have a reputation for being virtuous, but that’s not why I like them. They are milder in taste than beef or lamb, with a softer texture, so they offer a neutral canvas for a range of seasonings and bold condiments. This is a burger where more is better, so pile it on. Ground turkey is especially lean, and like all poultry, needs to be thoroughly cooked. Keeping turkey burgers from becoming dry can be tricky. Rule No. 1 is to pan-fry them rather than grilling them, good advice that applies to any ground meat patty (beef, lamb or turkey), which retains its moisture and is juicier when seared in a hot pan. Use a heavy skillet or frying pan — seasoned cast iron works best. And for a turkey burger, start it over high heat to get a great dark crust, then turn the heat down, and cook the turkey slowly, thoroughly, until it’s no longer pink within. Dark meat ground turkey has more flavor and a little more fat than white-meat turkey, and makes a great choice. A mix of both will also work well. Turkey meat needs seasonings. Soy, Worcestershire sauce or fish sauce add rich, dark notes of umami. While some cooks mix in eggs to bind and moisten the turkey, I find that a good mayonnaise does the same while enriching the meat with much needed fat. Once you’ve cooked the burgers, it’s time for condiments and don’t hold back! I go for bold tasting cheeses, salty cured meats, sautéed mushrooms and fresh, snappy greens. Just this past week at the farmers market, I stocked up on arugula, sorrel, mizuna, pea shoots and radish microgreens. Though delicate, these greens are so fresh they’ve lasted all through the week, ready to layer in sandwiches, pile on pizzas, garnish frittatas and add spicy crunch to burgers, as well as chicken, potato and noodle salads. The best bet for buns? The humble whole-wheat burger bun, lightly toasted, is sturdy enough to stand up to an array of necessary and deliciously messy condiments. Get out the napkins, as this better burger requires two hands. The first signs of spring are very sweet, literally. It’s maple syrup season and I’m just back from a friend’s sugar bush near Lake Superior where we tapped trees in the deep, quiet, snowy woods. At this time of year, you get a whiff of maple on the bright, damp spring air as the sap simmers into syrup. A group of us gathered to help schlep buckets of sap, collected from taps under the tress, to the huge pot set over a fire. We took turns stirring, while sipping maple-spiked coffee, cocoa and whiskey, stamping our feet to stay warm. Maple is North America’s most reliable indigenous sweetener. Sap is clear, mildly sweet, and runs when the day’s temperatures rise above freezing and then drop back down at night. The season begins in March and, most years, continues for about a month. Given our winter, this promises to be a very good year. It takes about 40 years for a tree to mature and produce sap, and about 45 gallons of sap to produce a gallon of syrup. The process of reducing the liquid to a thick, glossy syrup is simple. The first run of sap boils down to be relatively light and clear before the rush of starches have begun pulsing through the tree. As the season progresses, the syrup becomes darker, until the last run is as dark as wet tree bark. Maple syrup, once opened, is best kept in the refrigerator or it may turn moldy. Glass containers maintain the pure taste better than do plastic and metal. If mold develops, strain it out, bring the syrup to a boil in a saucepan, then cool and refrigerate. Golden: Light and translucent, this syrup is delicate and subtle. Save this for fluffy waffles, crêpes, vanilla ice cream, foods that don’t compete with its pure favor. Amber: This is the familiar maple syrup, sturdy and predictable. It’s the syrup for hearty pancakes and bacon, bourbon cocktails and glazes. Its flavor comes through, but does not overwhelm. Dark: This is the strong stuff, perfect for a barbecue sauce, New England baked beans, and to brush on a slow roasting duck or pork shoulder roast. It makes a wonderful alternative to molasses in ginger cookies and breads. Pair these with roast chicken or toss with pasta, fold into an omelet or strew on pizza. Preheat the oven to 400 degrees F. Run the leeks under cold water to remove any dirt or grit. Pat dry with a clean dishtowel. Place the leeks in a baking dish, add the stock and lemon juice. Drizzle with the butter, season with salt and pepper. Cover the dish with aluminum foil. Bake the leeks until fork tender, about 30 minutes. 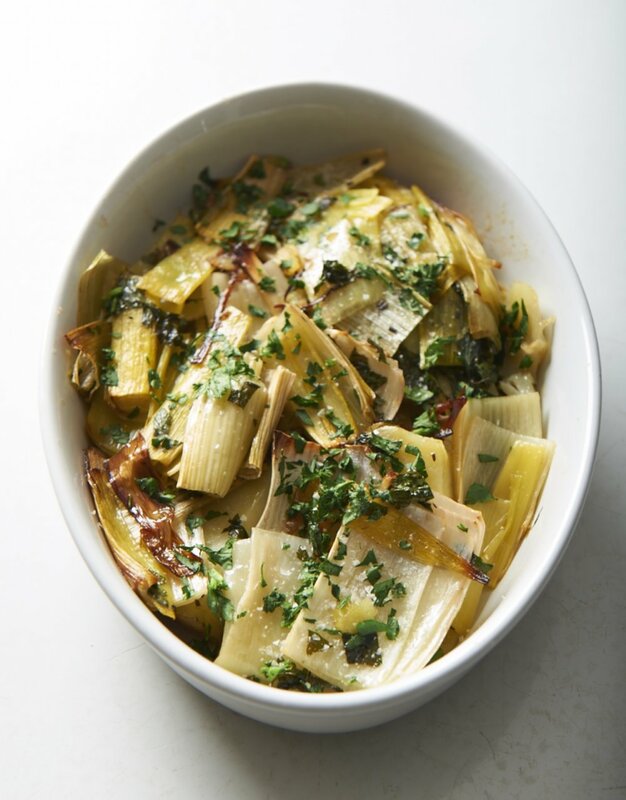 Remove the foil and continue roasting the leeks until the color begins to darken, about 10 to 15 minutes more. Combine all of the ingredients into a 10-inch sauté pan. Set it over medium heat and bring to a gentle boil. Reduce the heat an simmer, stirring occasionally until the jam begins to thicken, about 12 to 15 minutes. Remove the pan from the heat and spoon into clean jars, leaving a half inch f head room to allow for expansion. Wipe the rims with a clean wet cloth or paper towel, add the lids and bands, and finger tighten the bands. Once cooled, store in the refrigerator or freeze. Plan ahead when you're roasting vegetables so there are extras for other meals, including our favorite, roasted vegetable hash. Who can resist roasting all those wonderful autumn vegetables? The beets, squash, pumpkins, carrots, parsnips, rutabagas? Roasting these dense, earthy vegetables concentrates their sweet nature by drawing forth their sugars to brown the edges into a lovely caramel finish. The thing is, I always overdo it and make far more than we can ever finish at one sitting. So we eat them throughout the week after I stir them into soups and stews, toss them into salads and scatter them on top of pizzas and open-face sandwiches. Now that we’re revving up for the holidays, it’s good to have a few easy recipes for simple dinners and last-minute guests. When I roast extra vegetables for a party, it’s nice to have them at the ready for a meal the next day so I don’t have to cook. Here are some tips for the best way to roast autumn’s bounty, as well as ways to enjoy each last bit. • Preheat the oven and the roasting pan so that the vegetables hit a hot surface before they go into the oven. This expedites the process and helps make sure they’ll be evenly browned. • Be sure the vegetables are cut approximately the same size so that they roast evenly and in the same amount of time. • Spread them out on the pan so they don’t touch. This allows the air to circulate so that the edges crisp. • Shake the pan halfway through roasting so the veggies don’t stick. • Rotate the pan several times so that they cook evenly. • Be sure they’re nicely browned. • Toss with hot pasta, a little extra olive oil, sharp aged cheese. • Arrange on dark greens and dress with maple mustard or honey mustard vinaigrette and a handful of toasted nuts. • Stir into your favorite prepared soups or stews. • Scatter over pizza or hot open-faced sandwiches. • Best? Turn them into hash. Sometimes, we add a bit of ham, or turkey or (even better) bacon. These are terrific finished with fried or poached eggs. It takes but a minute to reheat the veggies in a heavy skillet so that they crisp up for an especially delicious casual dinner or special brunch. Think of all those holiday festivities coming up, dream of all those leftovers, and think roasted vegetable hash. Serves 8 to 10 (so plenty for leftover hash). Preheat oven to 400 degrees. Preheat 2 rimmed baking pans until hot, about 3 to 5 minutes. Toss the vegetables with the oil and salt, and scatter over the preheated baking sheets. Roast in the oven, shaking the pan occasionally and turning it once, until the vegetables are golden and begin to brown, about 45 to 60 minutes. Serve hot. Save leftover roasted vegetables, once they’ve cooled, in a covered container in the refrigerator. Note: Use any combination of roasted vegetables and add a little cooked bacon or sprinkle with shredded cheese for a more substantial dish. From Beth Dooley. Set a medium heavy skillet over medium heat and warm the oil. Add the vegetables and fresh thyme, and stir to heat through and crisp, about 3 to 5 minutes. Arrange on a serving platter or individual plates. Set a separate skillet over medium heat, melt the butter and swirl it to coat the pan. Crack the eggs into the skillet, cover and cook until the yolk is just set, about 1 to 3 minutes. Remove the lid. Using a spatula, carefully transfer the eggs to the hash. Serve hot. This pairing goes well with those chillier days and nights. As soon as temperatures drop, squash figures big in my kitchen, especially when it comes to warming soups. Think rich, thick bisques of puréed roasted squash seasoned with curry or ginger, lush with coconut cream. Or, how about a hearty vegetable combo, bright with bell peppers and emerald kale? Squash is the lazy home cook’s dream. Squash, in all shapes and sizes, is ubiquitous throughout the world, easy to grow and highly nutritious. It works well in a range of cuisines — Asian, African, Italian, Mexican — the possibilities for seasoning are endless. Granted that all the different varieties of squash are delicious with subtle variations in flavor and texture, but I favor butternut squash for soup. I’m fond of its earthy-sweet nature and dense, creamy texture. Its skin is smooth, unlike the bumpy turban or ridged acorn squash, so it’s relatively easy to peel. When shopping for any kind of squash, look for a firm, hard rind. This allows it to last longer, especially when stored in a cool, dark, dry place. Choose a squash that is heavy for its size with a stem that’s intact. Generally, it should be firm and dry, its color rich without any hints of green. The surface should be dull and matte; a shiny skin indicates the squash was picked too early. Avoid cracks and soft spots that can lead to mold. If there’s a challenge to working with squash, it’s in the peeling. The frequent mistake is to attack the squash with a standard vegetable peeler. A quicker and more reliable method is to cut the squash into wedges, then rest each wedge on a cutting board and, using a sharp, heavy knife, remove the peel and seeds. You’ll take some of the flesh with it, but given the size of most butternuts, that’s OK.
Roasting big hunks of squash takes about 30 to 40 minutes. Cut into chunks, squash cooks in about 20 minutes in a soup or stew and contributes a light subtle sweetness to the stock. Roasting chunks of squash draws out its unctuous texture and caramel flavors, in about 20 to 25 minutes time. When those chunks of roasted squash are lacquered with maple syrup and topped with whipped creamy, they make a fine dessert. These days, farmers markets are exploding with peppers, dark greens that are nearing the end of their season while squashes and root vegetables are coming on full. This soup brings them all together in one big, bright bowl. Note: Butternut squash contributes an earthy, subtle sweetness to the stock, while the beans are creamy and add body to this hearty dish. Pair it with crusty bread and a tossed salad for a meal. From Beth Dooley. In a large deep pot, heat the oil over medium and sauté the onions, garlic and sage until just tender. Stir in the squash, a generous pinch of salt, pepper and red pepper flakes, and the tomato paste. Then add the wine and stock. Increase the heat and bring to a boil, then reduce the heat to a simmer. Cook, partially covered, until the squash is tender, about 25 minutes. Stir in beans, bell pepper and kale; heat through. Adjust seasonings to taste before serving. Exchanges: 1 starch, ½ carb, 1 lean protein, ½ fat. Right now, my kitchen is full of comforting holiday smells. Gingerbread studded with tangy cranberries, just pulled from the oven, is cooling on the counter. Most years, I’m scrambling to make last-minute gifts for friends and family members. But this time I’m not letting my holiday goodies get away from me. These mini ginger-cakes actually taste better when made in advance, allowing time for the spices to mellow. They’re so rich with butter and molasses that they’ll stay moist for several weeks. They’re especially good served with dollops of cranberry sauce sparked with chunks of homemade candied ginger. Wisconsin is the fresh cranberry capital of the world. Though production is higher in New Jersey and Massachusetts, their crop is pressed into juice, dried or canned. I am partial to the organic cranberries from Ruesch Century Farm in central Wisconsin and James Lake Farms in northern Wisconsin, where berries are grown without chemicals in smaller bogs. They’re available at farmers markets and our local food co-ops. Now that it’s peak cranberry season, my sauce production is in full swing. My grandmother used a heavy metal grinder, clamped to her kitchen counter, for her fresh cranberry-orange sauce. Into the giant maw went the fresh berries with a whole orange while out came the tart relish she lightly sweetened with sugar. These days, I rely on a food processor to do the trick, use maple sugar for complex flavors and substitute a few sweet, thin-skinned clementines for the navel oranges once used. This sauce stays fresh for at least a week in a covered container in the refrigerator. It’s delicious swirled into mayonnaise for turkey salad, as salsa for chips, and a garnish for roast chicken. Cooking transforms cranberries into a pretty tart sauce that doubles for jam on scones, is great over vanilla ice cream or blood orange sorbet, terrific swirled into yogurt or baked into a crust. In a sauce, they thicken up as they cook because of pectin in the berries. For my recipe, the sauce is sparked with chunks of candied ginger to add not-so-sweet heat. Fresh, local cranberries are always the best choice; they’re sweeter than frozen and require less sugar to temper their bite. The only trick is to add the sweetener after the sauce is cooked. It doesn’t matter if it’s honey, maple, white or brown sugar, adding it too soon can make the berries tough — and it’s easy to add too much. I always make a little extra sauce, as a gift to myself. Makes 2 mini-loaves (6 to 8 slices per loaf). Note: These are just the right size for gift giving. The best part is filling the kitchen with wonderful smells. Wrap them tightly in plastic wrap and they’ll stay fresh and moist for at least a week. From Beth Dooley. Preheat the oven to 350 degrees. Grease and flour 2 mini (3- by 5 3/4-inch) loaf pans. In a medium bowl, whisk together the flour, cinnamon, ground ginger, nutmeg, cloves, baking powder and salt. In a separate bowl, beat together the molasses, milk, sugar, butter, fresh ginger and egg. Beat in the flour mixture; stir in the cranberries. Pour the batter into the prepared pans. Bake for 25 to 30 minutes, or until a toothpick inserted into the center comes out clean. Cool for 10 minutes; remove from the pans. Cool completely on wire racks before wrapping. Note: Serve this zesty, bright tasting salsa with chips, swirled into mayonnaise and whisked into vinaigrette. It will keep at least a week in the refrigerator in a covered container. From Beth Dooley. Working in batches, purée the clementines and cranberries in a food processor fitted with a steel blade. Turn into a bowl and stir in the sugar to taste. Note: Tangy and sweet with gingery heat, this sauce doubles as jam on scones or over ice cream. From Beth Dooley. Put the cranberries and cider into a saucepan and set over medium heat. Cook until the cranberries have just begun to pop and stir in the crystallized ginger. Continue cooking until the sauce thickens, about 3 to 5 minutes. Add the sugar or honey to taste. Serve them for a hearty rendition of bourguignon. Mushrooms make a terrific stand-in for many dishes featuring beef. When sautéed in a little butter or oil for a long time, they become firmer, denser and meatier-tasting. When properly cooked, mushrooms enrich soups, stews and sauces and are terrific in such classics as Beef Bourguignon. The best way to cook mushrooms is in a skillet in small batches, giving them enough space. This way, they release their juices and their flavors condense. Do not throw a whole pound of mushrooms into the skillet and crowd the pan because they will become soggy as they stew together and turn into a rubbery mass. Given more room in the skillet, they will caramelize and develop a deep, nutty taste. It takes patience and time. Mushrooms crowded in the pan and undercooked, I think, is the real reason some people say they don’t like them. Our co-ops and grocers offer plenty of good cultivated varieties of mushrooms — portobello, cremini (baby portobellos) and shiitake. It’s best to buy mushrooms whole, not sliced or cut and packaged; they should feel moist and heavy for their size. Place the mushrooms in a paper bag in the refrigerator until ready to use. Clean mushrooms before cooking them. It’s best not to run them under the tap because they absorb too much water. Instead, trim the stems with a paring knife and then wipe the stem and mushroom cap with a damp towel or soft brush. Alternately, you can rinse mushrooms, by dropping them into a bowl of water, lift them out and blot dry on a clean dishcloth or paper towel. Once the mushrooms are cooked, they will keep in a covered container for several days in the refrigerator or may be frozen and ready to add to soups or stews. Toss sautéed mushrooms with pasta or stir into rice with chopped parsley and a little cheese. Sautéed mushrooms are also delicious served on bruschetta and pizza. Note: This hearty wintry dish comes together quickly for a weekday supper but is elegant enough for a weekend dinner party. It doubles easily and may be made ahead of time, then assembled right before serving. From Beth Dooley. In a large skillet over medium heat, whisk together the oil and butter until hot and bubbly. Working in batches, sauté the mushrooms until browned on all sides, about 5 to 8 minutes, removing each batch to a plate until they’re all cooked. Whisk in the garlic, thyme and a sprinkle of salt, pepper and the red pepper flakes. Cook for 1 minute. Whisk in the wine and stock, scraping up any browned bits that stick to the bottom of the pan. Return the mushrooms to the pan, reduce heat and simmer until the liquid has thickened, about 5 to 8 minutes. Serve over cooked egg noodles and serve garnished with parsley. This spice blend dresses up potatoes for a memorable side dish with a dash of heat. Curry, the aromatic blend of warm spices, punches up the most ordinary foods. Take potatoes, this cold season’s reliable staple. Just sprinkle a little curry and a squirt of lime juice into the dressing for potato salad, and you’ve sparked a winning side dish. Add cooked chicken and you’ve got a light meal. There is no rigid definition of curry, but it most often contains a mix of ginger, garlic, turmeric, chile peppers, cumin, fenugreek, fennel seed, caraway, cinnamon, clove, mustard seed, cardamom, nutmeg and black pepper. The ingredients will vary depending on the cook and the region’s influences. India, Pakistan, Bangladesh, Sri Lanka, Nepal, Indonesia, Malaysia, Thailand and the Caribbean all prize their own curries. It makes sense to find a blend or several blends to suit your individual tastes. Potatoes work nicely with curry, as their neutral flavors can take the heat. The best potatoes for salads are the waxy varieties such as Yukon Gold, Red Bliss and fingerling. They have the least amount of starch and retain their shape when boiled. Be sure to start the potatoes in cold water, not boiling, and to salt the water generously. The potatoes will absorb some of the salt so that they’re seasoned from the inside out. Be sure the potatoes are cooked thoroughly, so that they’re firm, not crunchy or overcooked and mushy. They should be barely tender when pierced with a fork. This salad will hold a day or two in the refrigerator and so may be prepared ahead. Double the recipe for a party but save some for a weekday dinner. Curry favor and comfort with this down-home dish. Place the potatoes in a large pot with enough water to cover by several inches. Bring to a boil over high heat, add the salt, and reduce to a gentle boil. Cook until the potatoes are tender when pierced with a knife, about 15 to 20 minutes. Drain into a colander. Allow to cool enough to handle, then cut into 2-inch chunks. In a small bowl, whisk together the mayonnaise, yogurt, curry powder and lime juice. Place the potatoes into a large bowl along with the bell pepper, add the dressing and toss to thoroughly coat. Season to taste with salt and pepper. Serve warm, at room temperature or cold. Reach for the sweet potatoes for an unexpected flavor in this cold-weather dinnertime favorite. Chili is the perfect one-pot winter meal. It’s quick and warming and possible to make with locally grown dried beans and sweet potatoes. You can find the local dried beans in co-ops and winter markets. Look for Jacob’s Cattle (with white and red spots), Marfax (tiny brown beans), Swedish Brown beans (larger brown beans), and cranberry (a deep maroon). They all add color and flavor to any soup or stew. Because all dried beans are relatively neutral in flavor, they may be used interchangeably, so if the local heirloom beans are not available, any of the common varieties will do nicely. The biggest difference is between canned and dried. Canned beans, as convenient as they are, seldom taste as good as those cooked at home. But there are times when they save the day. I prefer the brands from natural food companies, such as Eden. Though more expensive than others, the textures are better and beans are far less salty. Soaking beans before cooking reintroduces moisture, shortens the cooking time, and makes it easy to remove the over-dry or immature beans that float to the surface. Soaking also helps make the beans more digestible. For an overnight soak, cover the beans with water at least four times their volume and allow to stand at room temperature overnight (or at least for four hours). Lacking time, quick-soak the beans by covering them with four times their volume of water, bringing to a boil for a full minute, then allowing them to stand for one hour. Once the beans have soaked, pour off the soaking water, cover with 2 inches of fresh water and bring to a rolling boil for about 10 minutes. Scoop off the scum from the surface. Then reduce the heat and simmer the beans until they are soft and creamy, but not falling apart. The cooking time will depend on the type of bean and its maturity, but most take between 45 minutes and 1 ½ hours. Once the beans are cooked, drain before using. They can be held in the refrigerator for several days in a covered container. This chili recipe works well with both freshly cooked and canned beans. I like using a mix of beans for color, but a single variety works equally well. The chili tastes even better the next day. Heat the oil in a large pot over medium heat and sauté the onion until translucent, about 5 to 7 minutes. Stir in the sweet potatoes, garlic, chipotle in adobo, chili powder and cumin, and cook, stirring until the spices smell fragrant, about 1 to 2 minutes. Stir in the tomatoes and stock, and bring to a simmer. Cook, stirring occasionally, until the sweet potatoes are tender, about 30 to 35 minutes, adding more stock if necessary. Stir in the beans and continue cooking until heated through, another 3 to 5 minutes. Season with salt and pepper. Serve garnished with the cilantro.